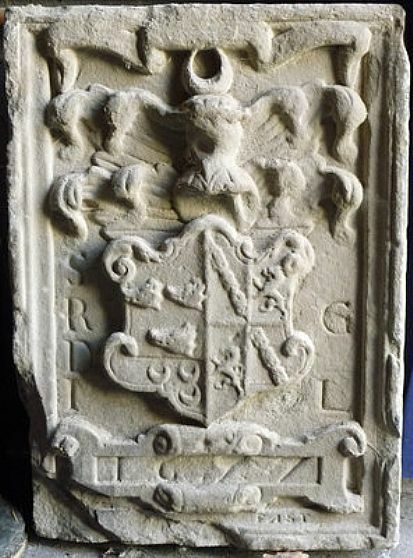 This beautiful armorial stone of Sir Robert Gordon of Embo was on loan to Historylinks for a few months in 2010, providing an opportunity for public viewing. This stone from Embo house, dated 1677, shows the initials of Sir Robert Gordon and his wife Dame Jean Leslie. It also shows heraldic symbols of both the Gordon and Leslie families. At the end of June 2010 the museum embarked on a project to carve a replica of an armorial 'Marriage Stone'. Stone mason, Joanne Coombs, of Dornoch, was commissioned by Historylinks Museum. Joanne had two three day sessions at the museum working on the replica attracting an appreciative number of local residents and holiday visitors. To launch the project primary five pupils from Dornoch Primary School were invited to come along to the museum on 21st July to see Joanne at work and to learn more about the local coats of arms found in this part of Sutherland. They then made their own Coat of Arms and these were displayed in Dornoch Cathedral throughout the summer months. At the Annual General Meeting of the Dornoch Heritage Society on 30 September 2010 the replica armorial stone carved by Joanne Coombs was officially unveiled. On the 30th April 2010 Primary Six pupils from Dornoch Primary School took part in a field walking exercise arranged by Jacquie Aitken, Historylinks Outreach Officer. 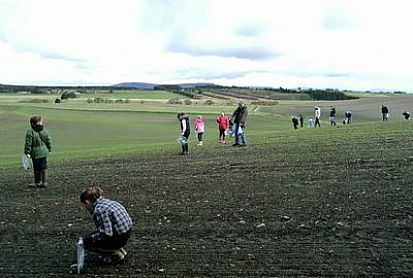 Walking in lines across a field on the edge of Dornoch the children picked up over 1000 finds ranging from Medieval to 20th century pottery, animal bone, slate roof tiles, glass and metal objects. Two workshops followed at the school and the children were able to clean their finds and then draw the one which most caught their imagination. On Remembrance Day 11 Nov 10 an article in the Daily Telegraph reported a project undertaken by Pam and Ken Linge to add personal detail to those listed as 'Missing' on the monument in the Commonwealth War Graves Commission Cemetery at Thiepval. 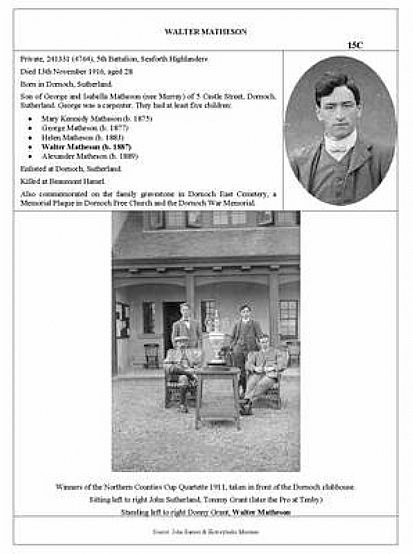 One of the Historylinks projects for the Scotland Year of Homecoming 2009 was the addition of all available personal detail, including photographs, to all those listed on the Dornoch War Memorials. (See Exhibits - War Memorials) and the contents for the page for Private Walter Matheson, commemorated on the Thiepval Memorial, France Pier and Face 15, was offered to the Linges. Our website page shows a photograph of Walter extracted from a group photograph when he was a member of the Royal Dornoch Golf Club foursome which won the Northern Counties Cup Quartette 1911. The Daily Telegraph article included some photographs, one of which was of a competitor in the 1908 Olympics killed in WW1, with no known grave and listed amongst the missing on the Thiepval memorial. With this in mind, the group photograph (object no. 2001.062) including the magnificent Northern Counties Cup was sent to Pam and Ken Linge. Very promptly the Linges provided for approval a proof copy of the page to be included on their Thiepval website . The page, shown here, includes an appropriate reference to Historylinks as the source. Pam and Ken Linge's project deserves widespread support and if you have any details of a serviceman commemorated amongst the Thiepval Memorial 'Missing' you may wish to contact them via their website. Unfortunately the Thiepval Memorial database can only be accessed on computer terminals provided at the Military Cemetery.